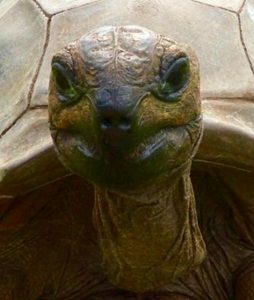 Plantation House tortoise Myrtle – the smallest of the group of five – passed away on Tuesday night, 5 July 2016, despite the best efforts of Plantation and veterinary staff. In consultation with previous Senior Veterinary Officer, Joe Hollins, the cause of death is believed to be a female orientated obstetrical problem combined with kidney failure. This is important, as it rules out any contagious problem which might have had implications for the other tortoises. Large ‘stones’ found inside Myrtle’s body were in fact calcified groups of eggs which were blocking her reproductive tract, likely causing egg peritonitis. This, combined with high urea levels – caused by kidney failure – appears to be the cause of death. Having arrived to the Island in 1972, Myrtle was believed to be approximately 70 years of age at time of death. She will be buried in the Plantation House Paddock, on the Island which has been her home for 44 years. A recent picture of Myrtle is attached.